We love holidays just as much as the next person, but what we don’t love is melting foundation and panda eyes on the beach. Holiday’s are the perfect opportunity to go ‘au natural’, giving your skin a much needed rest from heavy make-up and allowing it to breath. However this is easier said than done if you are a make-up fanatic who won’t even venture to the corner shop without a full face. Eyelash dyes, or 30 day mascaras are a great compromise for holiday. If you can’t afford a trip to the salon for a tint then home dye kits work perfectly as well and mean you can go to the beach mascara free but still with gorgeous looking lashes. Eyelure and Coloursport each offer a home dye kit essentially comprised of the same components and applied in the same way. Both kits come with a cream and a liquid which are mixed together following the instructions and then applied to the lashes and left for the designated period of time before being wiped off. The final result really depends on the initial colour of your lashes but we found our lashes appeared darker, glossy and very slightly thicker after application, a perfect low key holiday look which won’t come off in the pool. The only downside to both products is the rather unhelpful applicator which makes the entire process of covering the lashes far more difficult than it ought to be. We recommend you pop and buy a mascara wand or simply clean of one of your old ones and use this to apply the mixture. 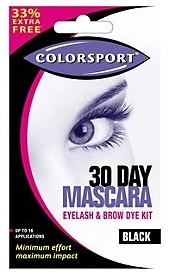 Coloursport 30 day mascara eyelash and brow kit £8.25 and Eyelure dyelash £6.99 are both available from Boots.